Tony Byrne is one of Australia’s most experienced property managers. In a career spanning over 30 years, Tony has managed some of Australia’s most successful and innovative commercial assets, as well as a number of high-profile international projects. 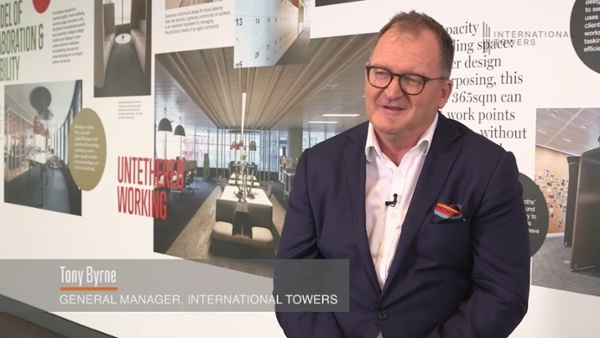 As the General Manager of International Towers, Tony plays a pivotal role in the way culture supports one of Australia’s most progressive workplaces. How important is culture in the context of managing a building? I believe culture defines who you are, no matter what type of business you’re in. Every company has a culture, whether it’s a bank, a bakery or a building. I believe culture has to be ingrained in everything you do for it to have any meaning or purpose – your language, your actions, your behaviour, and your values. One of the things we did here at International Towers very early on, was change the language around how we refer to our clients. We call them partners, not tenants, because that’s the type of relationship we want to have with them. Naturally, that has a big impact on how we go about our dealings and negotiations with them, because a partnership is very different to a traditional tenant-landlord relationship. It can actually take quite a bit of time for both sides to understand and realise what it means. But when a building owner can have direct conversations about opportunities for collaboration and continuous improvement, then the results can be extremely positive. It can lead to better retention of talent and enhanced productivity. Happiness improves, and so does revenue – for both sides. For the organisation, the building becomes a partner in its success. And for the building, we become the workplace of first choice. So even that simple change of language, one simple word, can have a very profound and significant impact on how the business is run. What are some of the key aspects of successful cultures? One of the most important attributes of a successful culture is having diversity of ideas, and just as importantly, providing an environment where different ideas have a voice. In my opinion, the best way to fast- track mediocrity is to always have consensus of opinion. It’s fundamental to a healthy culture – and it’s the very foundation for a healthy democracy – that there are a mix of opinions that are respected and considered before decisions are made. We experienced this recently with our support for the YES Marriage Equality campaign. Providing support in the form of hosting the campaign’s headquarters was very much aligned with our organisation’s values. But naturally it was a very polarising issue for many people, so it was critical that we allowed people within our own team an opportunity to express their views freely and without fear, and to respect the beliefs of every individual during that process. How can a property, or a built working environment influence culture? The built environment has such a profound impact on the way people behave and feel, that it is absolutely crucial in supporting every one of a company’s cultural initiatives. The white paper recently produced by Professor Anthony Grant and his team at the University of Sydney has now made that connection official. You can read more about Professor Grant’s findings later in this publication. There are so many examples of a building playing a key role in the performance of a business. Not so many years ago, the Commonwealth Bank was ranked fourth out of the top four banks by graduates as their first-choice employer. However, after moving operations to Darling Quarter in Sydney’s Darling Harbour precinct, and using that as an opportunity to rejuvenate its culture, the bank soon began ranking as number one, and I’m confident the workplace played a huge role in that. The location itself become a highly attractive attribute, and somewhere younger people wanted to be. We also saw similar results with Westpac, who experienced a significant reduction in sick leave across their workforce not long after moving to International Towers. So, the connection between a positive built environment and a positive culture, and strong business performance is very real. How much then does the built environment rely on how it is managed? Enormously. The interesting thing about property management is that almost all of the education is based on fiscal outcomes and operational technicalities, such as rent yields, lease inclusions, market reviews, gross reviews, allocations, shared services tables and so on. The one thing that isn’t in the ‘manual’ is culture. Culture is hard to define and even harder to teach. It needs to have buy-in from the owner, all the way through the organisation to the service staff. The person responsible for cleaning the bathrooms at night needs to feel just as good about where they work, and feel just as respected and valued as the management team representing the asset owners. Everyone needs to feel like they are part of the same team. I’m a huge supporter of the concept of ‘team’, where everyone on the property management side and on the client side feels like they’re working together for the same goals. And to have a successful team, you need true partnership. Explain how you maintain a positive culture within a building that has so much diversity. It all comes down to values. Diversity can thrive in an environment founded on common values. So our role as building managers and owners is not to stifle diversity, or even to try and constrain a diversity of cultures injected into the building through our partners, but to ensure that everyone in the building community shares a set of common values. When we speak to prospective organisations who are seeking to join our community, it’s the very first conversation we have, well before we start discussing their physical requirements, because we know if our values aren’t aligned, then regardless of what we’re able to negotiate, it won’t be the right fit. That’s why it’s so important things such as Green Star ratings for fit-out are committed to, and that their processes and procurement policies are aligned with our own values. They don’t have to be identical, but as long as we share an aligned vision and share similar beliefs, we know we’ll have a successful partnership. Even down at a very personal level, most long- term friendships are based on shared and aligned values. You may not agree on everything – and sometimes that can be very healthy for a relationship – but ultimately you share a common set of beliefs, and that’s how you can build trust and that’s how you can move in the same direction. Culture creates a community, and being part of a healthy, vibrant, positive community is a fundamental need for all of us. So by nurturing and encouraging positive behaviour, we are helping our community thrive. And who wouldn’t want to be part of that?